Throughout 2012 we are sharing an illustration with you every week to help you to re-imagine the future that you choose. For the twenty-first week of 2012 we are sharing Noel Hatch’s Future. Noel is amongst other things the Co-Chair of the Cooperative of the Transeuropa Network. The sun has started to shine in London, and we are thinking about festivals.. 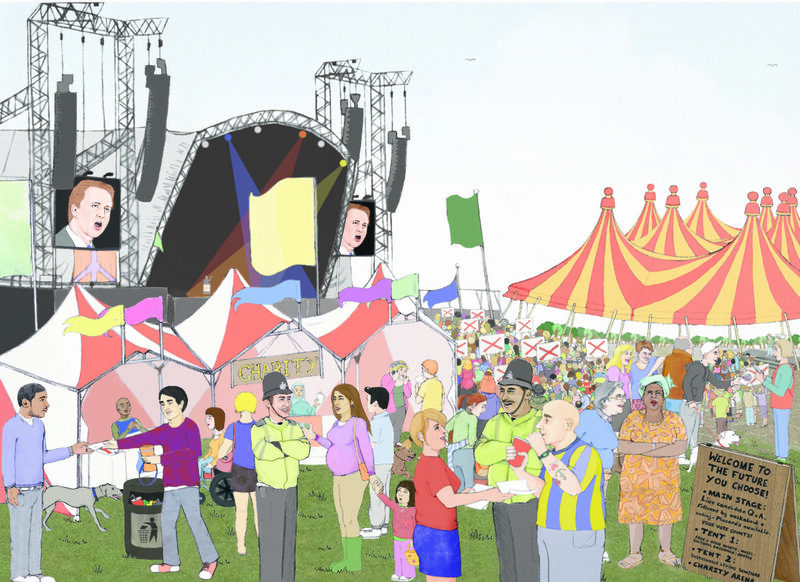 There is no Glastonbury Festival this year, but there is always space for Glastopolitics. I chose to illustrate Noel’s quote because the description of his future was so evocative; I could see the image that I wanted to create in my mind’s eye as soon as I read it. I am a big fan of capturing personalities, and the festival scene that I was inspired to create gave me the perfect opportunity to do this! I loved Noel’s idea of lots of characters from all different walks of life coming together in a forum for the greater good, and to me the idea of a Glastonbury style festival seemed like a really exciting way of meshing all of these different characters together. Follow Noel on Twitter @noelito and read his Futures Interview in full, here.